Last year, I traveled to Belgium and was able to visit some of the world's greatest breweries. Though I no longer drink traditional beers, I discovered that Green's gluten-free beers captured the essence of what makes Belgian beers special. Green's beers have been brewed since 2004 at the legendary DeProef Brewery in Lochristi, Belgium, making them one of the longest continuously produced gluten-free beers in the world. In place of barley malt, Green's uses a blend of millet, sorghum, rice and buckwheat. All four varieties have received accolades: the Amber Ale won a Gold Medal at the 2013 World Beer Championships and the Dubbel Ale took the Top Gluten-Free Beer award at this year's Calgary International Brewfest. Quest Tripel Ale (8.5% ABV): My introduction to Green's was the Tripel Ale. I was pleasantly surprised when I detected the unmistakable scent of Belgian yeast and familiar banana and clove aromas. Fruity and tart, this beer is heavily carbonated. And fair warning - it packs a punch at 8.5% alcohol by volume, something you don't see often with gluten-free beers. Pair this with some spicy paella or cajun food. Endeavour Dubbel Ale (7% ABV): When I poured this into a Chimay glass and put it side by side with a non-gluten-free Dubbel I couldn't tell the difference; it had the same dark appearance and over an inch of head. Apple, cherries, caramel and spice dominate the flavor. Pour this into a goblet or wide-mouthed glass and let it sit a bit to reduce the carbonation and warm up to get the full flavor profile. Try this with some dark chocolate or cheesecake. Discovery Amber Ale (6% ABV): This brew pours a reddish-brown color with some sticky lacing on the glass. Nice caramel and raisin flavors combine with a pleasant malty sweetness to make this my favorite of the Green's lineup. This beer will taste great alongside chicken, seafood and even spicy dishes. Enterprise Dry-Hopped Lager (4.1% ABV): Green's newest beer, Enterprise was created in response to demand for a lighter beer with more hops. This lager is a big departure from their normal Belgian-inspired line of ales. Clear and crisp, the lager gets its pleasant floral and citrus notes from the inclusion of West Coast hops. Enterprise will go great with lemongrass-infused Thai and Vietnamese dishes. 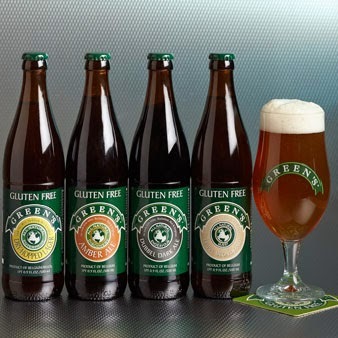 Green's provides those seeking Belgian-style gluten free beers three excellent offerings. The recent addition of a fourth beer, an American-style lager, shows the brewer is willing and capable of brewing other styles. I'd highly recommend these brews to those new to gluten-free beer and to others with experienced palettes. Chris Betz has traveled the world in pursuit of unique and rare beer. Since being diagnosed with Celiac Disease he has a new challenge: exploring the world of gluten-free beer.